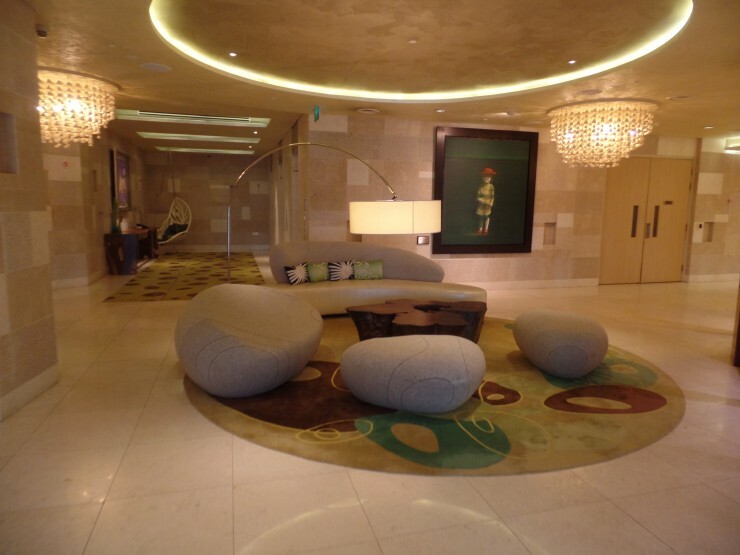 We took a taxi from Singapore Changi airport directly to the W Singapore, which took roughly an hour. At a cost of roughly 25 SGD, we felt like it was a pretty good value. 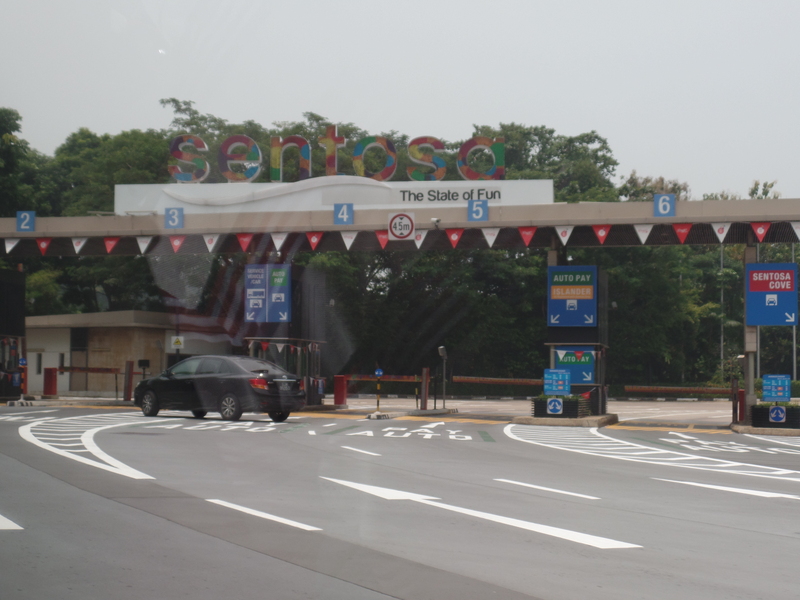 Note: You will want to have your hotel confirmation available, as that will save you 5 SGD when driving onto Sentosa Island. Arriving at the W Singapore, you enter on the first floor to a small lobby (if you can even call it that), and have either a flight of stairs, or a short elevator ride up to the second floor where the real lobby is. We had a short wait to check in, which gave us the time to observe that the check-in process was pretty lengthy, our own took roughly 8-10 minutes. 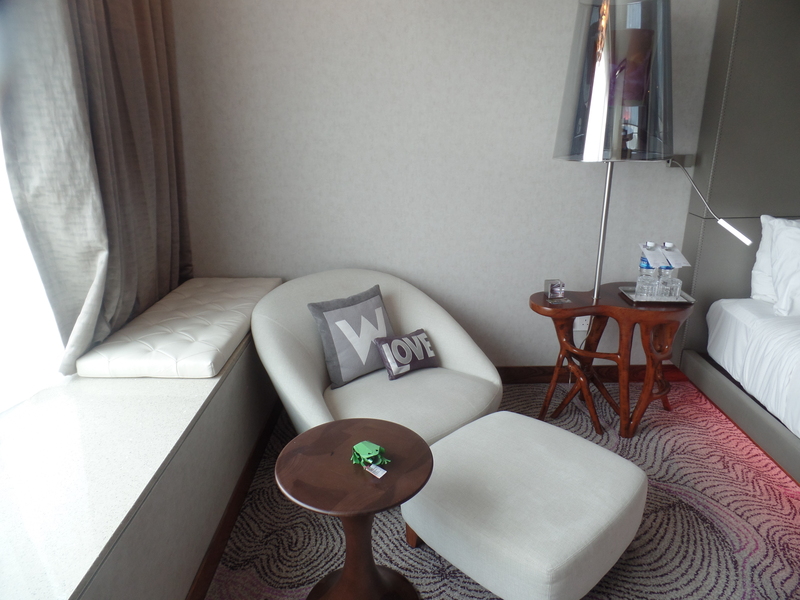 I’m not sure if this is standard, as this was our first W stay. 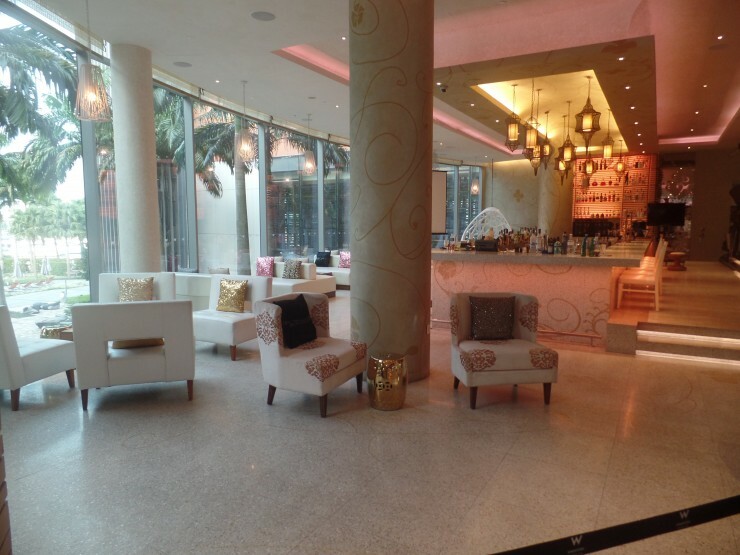 Luckily, my wife’s SPG Gold status was still active (you can get that status from having the American Express Platinum card), so we were offered points of a free beverage at the bar. This offer was further refined when the kind lady checking us in realized that she wouldn’t be able to upgrade us, so she gave us the 250 SPG points, as well as 2 complimentary drinks at the Woodgrove bar. Unfortunately, she also informed us, that since we were on a 100% points stay (at a whopping 25k SPG points), we would not be eligible for free breakfast. 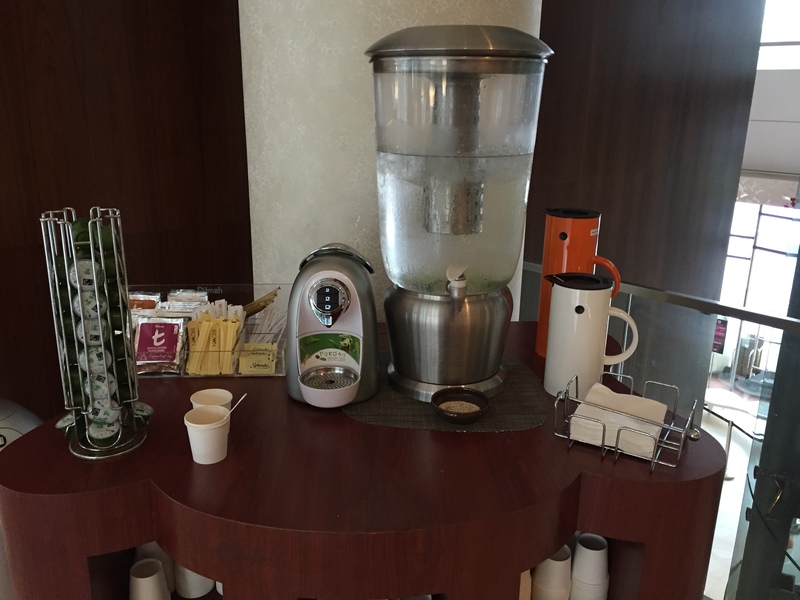 Normally I stay at Hyatt or Marriott properties, and both provide free breakfast on all points stays, at least, last I checked, so this threw me for a bit of a loop. 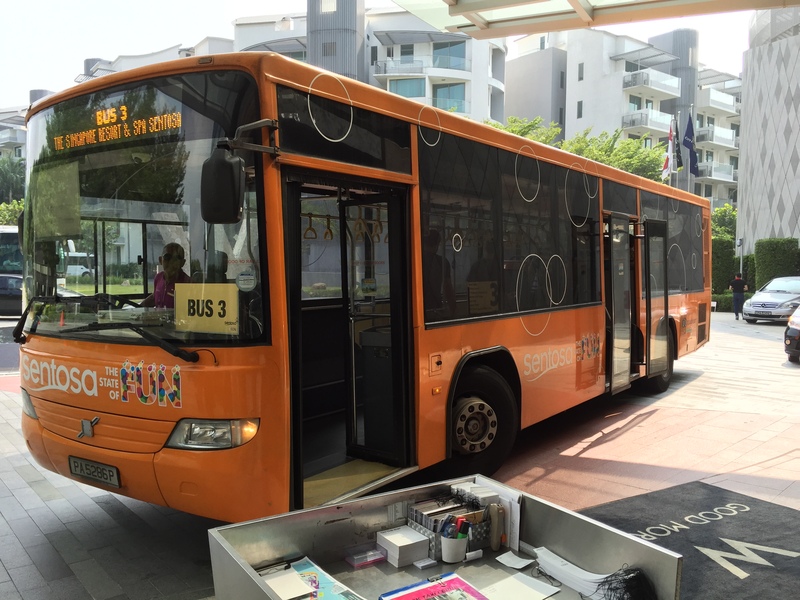 It wasn’t a huge deal though, as it gave us a chance to explore more of Sentosa in search of a bite to eat. We had a pretty standard looking room, overlooking the front of the hotel. This proved to be a great thing, as we could see when the bus made it to the hotel, and could then do the math (since it was 35 minutes between trips), to figure out when we would want to be down in the lobby. 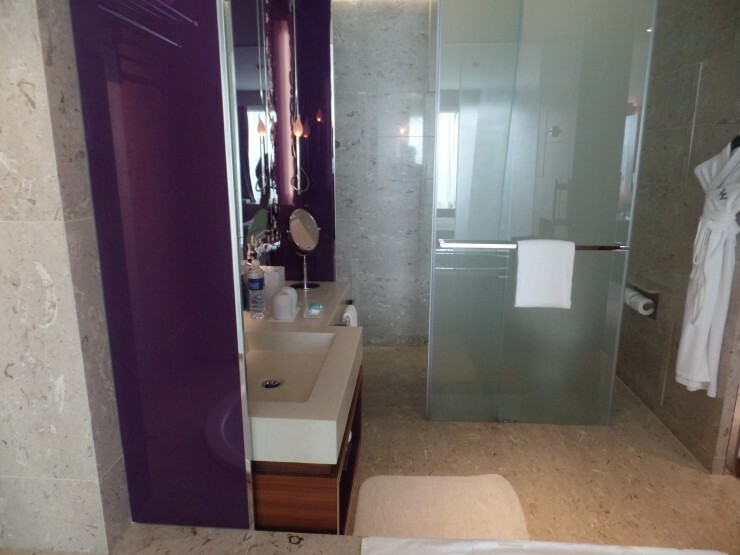 The bathroom was spacious, with a shower, soaking tub, and obvious toilet. It was a bit awkward though with the door for the shower and toilet being shared. The toiletries were “Bliss,” which was funny to my wife and I, since we had attempted to resell some Bliss products we had picked up at a favorable price, only to find out that they fit into the “Luxury Beauty” category, requiring further special permission. 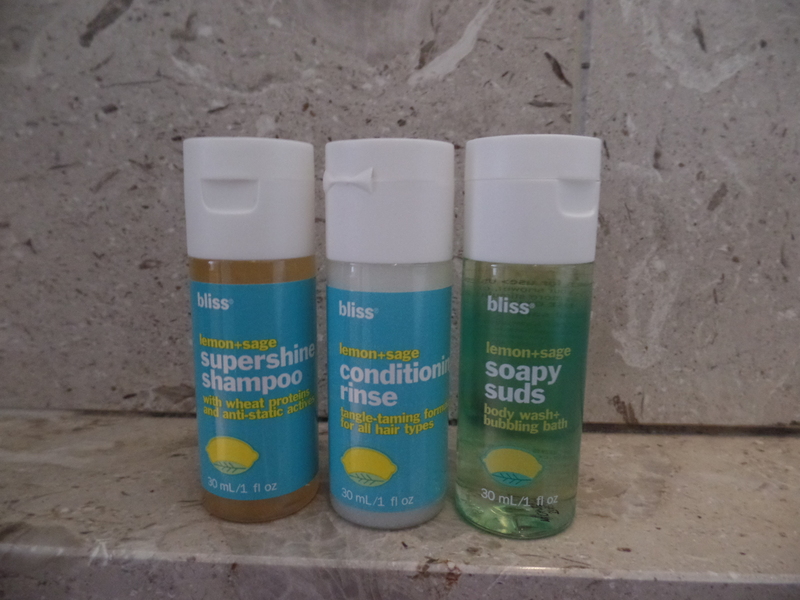 We certainly enjoyed the lemongrass scented luxury amenities though! The main bedroom was interesting. Behind the bed was a headboard/wall that lit up different colors, depending on which button you pressed on the wall, there was Hello (regular), Escape (Purple), Runaway (Bluish-Green), Flirty (pink).The bed was especially comfortable, in fact, we took a nap the afternoon we were there, and I had 2 hours of some of the best sleep I’ve had in years. The pillows were king sized and great as well. One thing that threw us a bit for a loop, was that the TV had a special Bose system integrated into it, so when you turned the television on, you got no sound. It took a bit of playing around before we realized a small button on the lower left of the remote marked “Bose” provided sound. Overall though, we found the room to be more than sufficient, with some very awesome comforts. 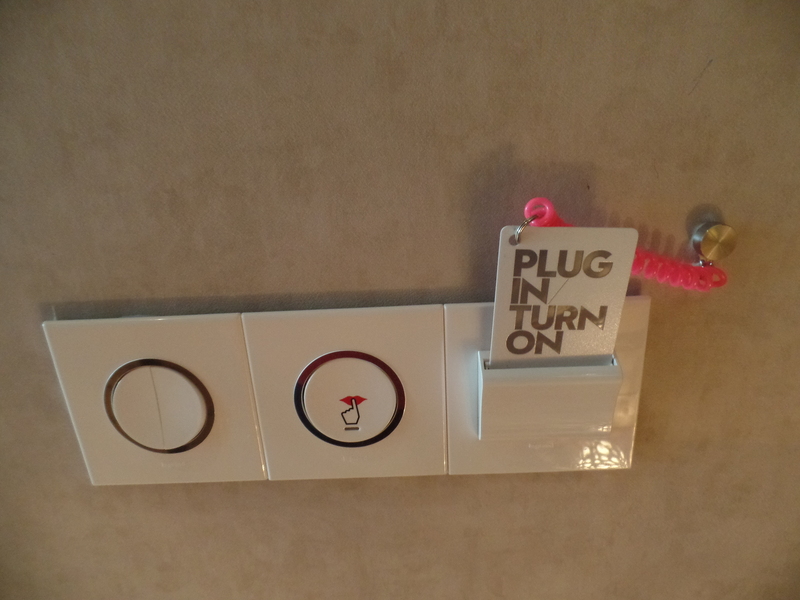 A nice feature was the “Plug In/Turn On” key card already provided in the room which is an energy efficient measure. I suppose the key cards kind’ve defeat the purpose, but, we appreciated it. 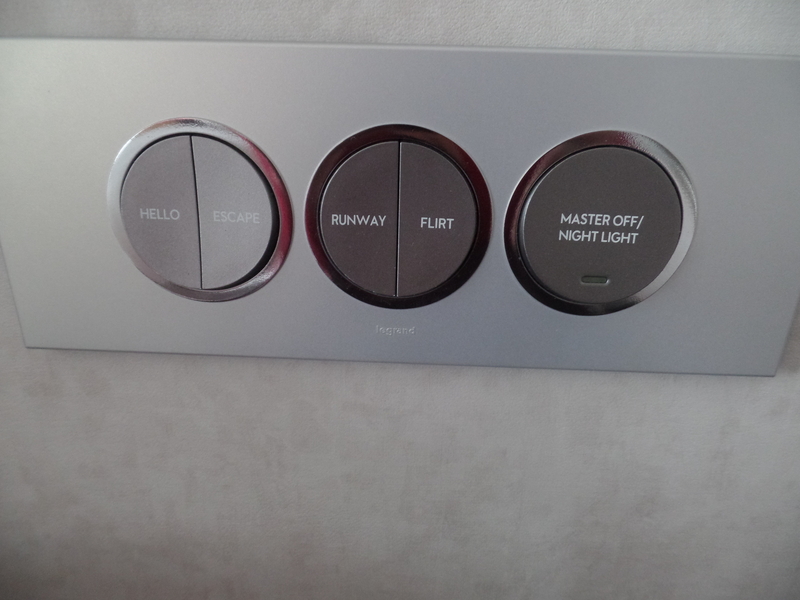 The privacy was also kind’ve sassy, like the rest of the room. 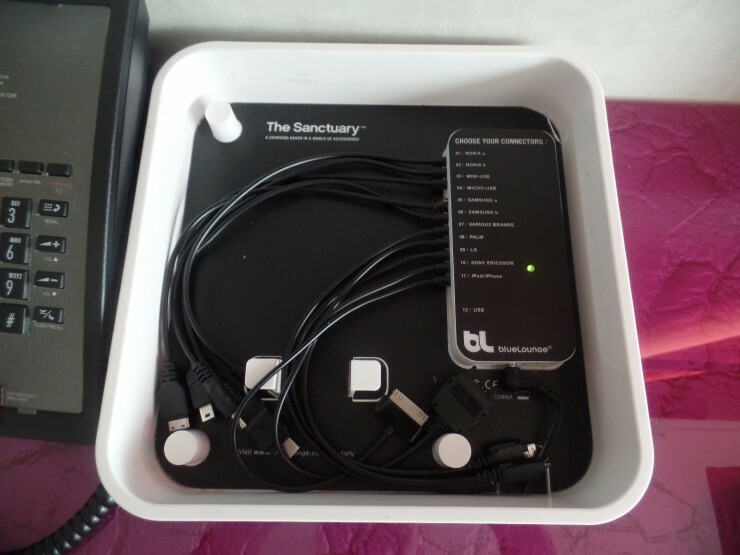 We also appreciated “The Sanctuary” which was supposed to be a charging station, the only problem we ran into was that the micro USB cable was missing. If there is one thing I got from this hotel, it was that the hotel was trying too hard to be “trendy,” Now this could be a direct result of not being very “trendy” myself. Of course, there were other aspects that didn’t work for us. The biggest of them was the pool. 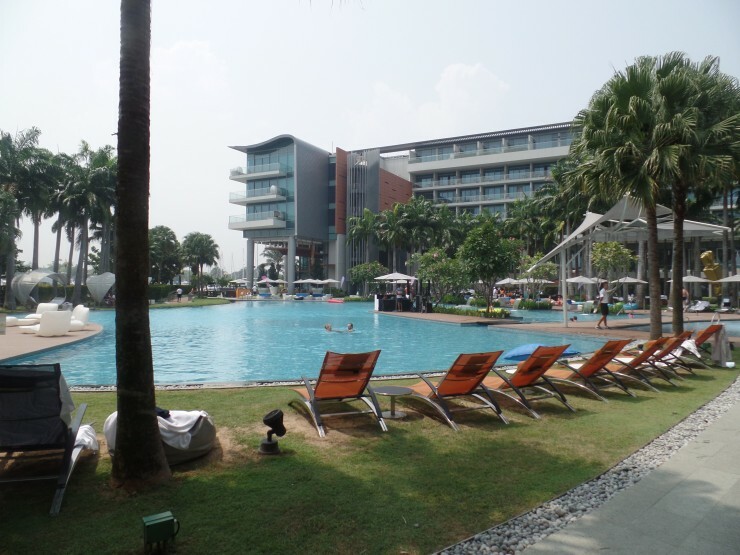 Here we are, on Sentosa Island, thinking that this is the perfect opportunity to relax by the pool, swim some, and enjoy the pool bar. Boy were we wrong! There was actually very little (comparatively speaking) seating around the pool. It was so sparse that the hotel augmented it with lounge chairs on a grassy area. Of those few seats, few really had shade. For me, who burns easily, I really need some level of shade, but for others who want to be out in the sun, this will work for you. The hotel was also doing a part (in honor of Formula 1 weekend), which resulted in heavy bass being blasted, which, for us, was another downer. I see what they were trying to do, but, interestingly enough, the demographics just didn’t support the effort, considering that we were some of the younger folks around the pool. One of the aspects that we really appreciated in the morning was a small nespresso-like machine, accompanied by a cold water reservoir, and a carafe of hot water (and tea left out). It sounds small, but, a nice cup of espresso or tea in the morning, gratis, is always appreciated, especially when its high quality stuff! 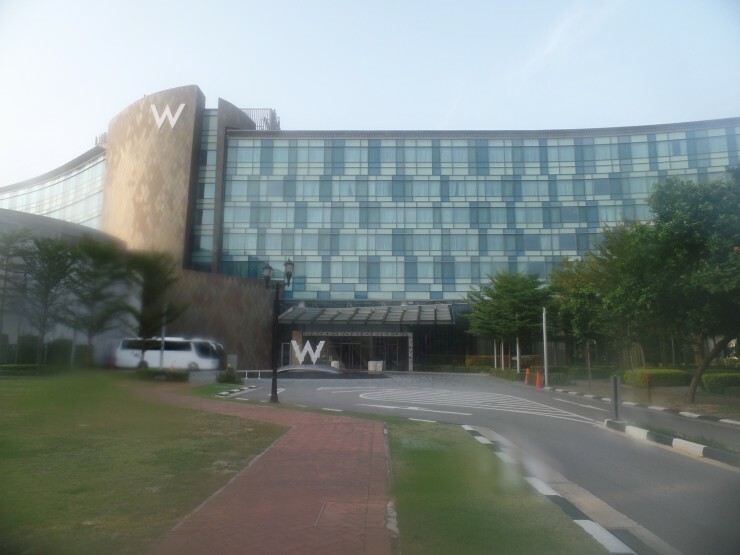 It is important to note that the W Singapore is kind’ve far from nearly all the Sentosa Island attractions, in fact, the hotel has it’s own shuttle, and there is a Sentosa Island Bus 3 that also services the hotel, however the latter only has a frequency of 35 minutes, vs. 10 minutes for the other buses, and 4 minutes for the monorail. Despite the remote location, there was roughly a dozen restaurants not associated with the hotel, within a short walk. We ended up eating at one of them, a pub, our only night there. They had reasonably (for Singapore) priced food, and beverages, including promotional buckets of beer. Definitely worth exploring if you’re staying at the hotel. We booked this hotel primarily because it was available during Formula 1 weekend. 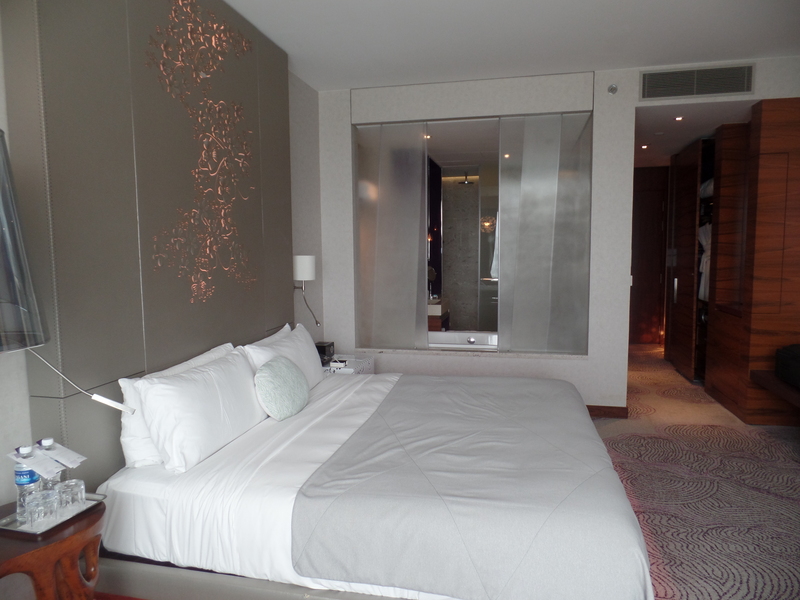 At a price of 560 SGD, we felt it was worth burning 25k SPG points for. 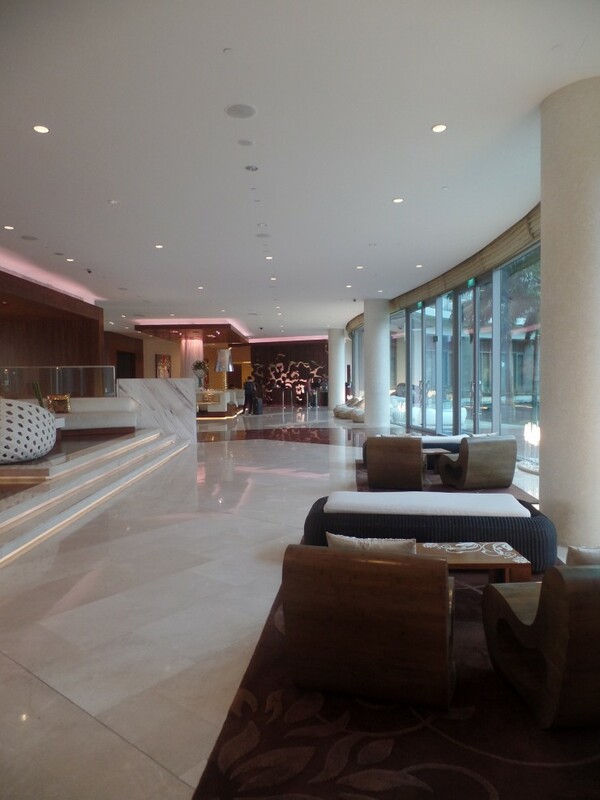 We also had wanted to visit Sentosa Island, so this hotel really helped us accomplish two goals. 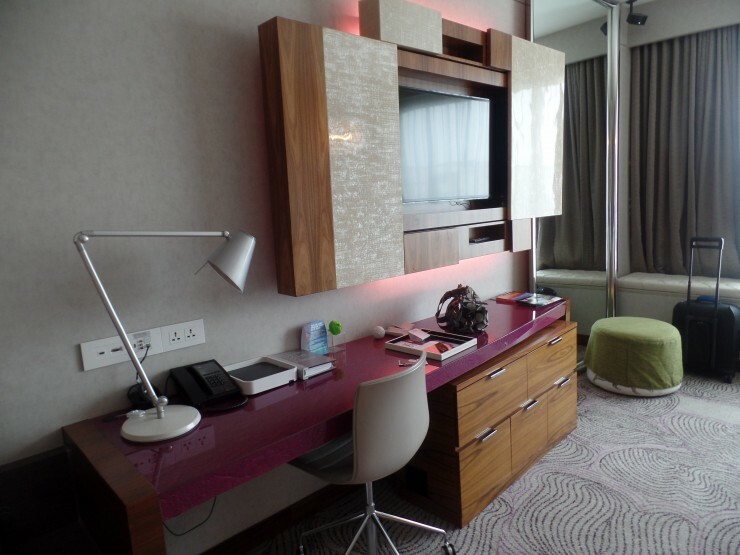 The room was really the best part of the hotel for us, the bed was comfortable, the amenities were high quality, and those were two factors that made a big difference for us, after having traveled for nearly 24 hours to get to Singapore. Some of the public areas made us think that the hotel was just “trying too hard,” or as my wife aptly commented, perhaps the hotel belonged more on Miami’s South Beach, rather than in Singapore. Coming back to brass tacks, we’d return to this hotel, primarily for its comfort.